Whenever an emergency 999 ambulance call is made, an emergency Ambulance is immediately dispatched and a first responder is also directed to the emergency. 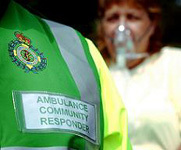 First Responders are volunteer members of the community who are trained to respond to emergency calls through the 999 system in conjunction with the Ambulance Service. Our Responders provide immediate care to patients in the Worth Valley Ward where there may be a delay before the arrival of an ambulance. They are trained to deliver Basic Life Support and defibrillation to patients in Cardiac Arrest and appropriate calls including oxygen administration to patients suffering from a range of conditions. WVCFR is today celebrating the New Year with a £500 donation from Bradford based Sovereign Healthcare. The company, which provides health insurance and hospital coverplans, made the generous donation after learning about the lifesaving work of the Worth Valley Responders. This money will go towards further training, and provision of new equipment and clothing. Three groups are sharing £6,500 after impressing Keighley councillors with their community work. The cash has gone to Worth Valley First Responders, Keighley in Bloom and Friends of Ilkley Moor. Keighley Area Committee, part of Bradford Council, received reports on the groups’ activities at its November meeting. It heard that the trio’s efforts helped to tackle priorities in the committee’s Keighley Area Action Plan. The plan covers issues like crime, young people, regeneration, health, community life and the environment. The committee gave £2,500 to Worth Valley First Responders to buy new life-saving equipment. The responders are highly-trained volunteers who tackle emergencies in the vital minutes before paramedics arrive. Christmas has come early for a group of volunteer emergency medics. Jess Wright Graphics, of Manywells, in Cullingworth, has played Santa by presenting the Worth Valley First Responders with two sets of purpose designed ambulance logos. These have been put together free of charge to identify the vehicles used by the team to respond to 999 calls in the area. The high-visibility logos are reflective, so will inform other road users of the responders’ urgent business during the day and night. They are also meant to help ambulance crews locate the patient’s address. The group will be working over the Christmas holiday period, providing vital first aid to patients in the minutes before the ambulance arrives. Worth Valley CFR's is today delighted to announce that they have been successful in an application for a grant towards Education and Training of team members. The Bowcock Trust Fund of Keighley has awarded us £350, which will be used to put members through further training, to help ensure that our responders are well prepared for any emergency they are dispatched to. Worth Valley CFR's is pleased to announce that Corporate Leisurewear will be our new supply pertner for our Uniforms. We are pleased to be supporting a local company, as CLC is based only 5 miles down the road in Keighley. For more information on the extensive range of embroidered or plain garments, please visit http://www.clcsport.co.uk/. Worth Valley CFR's has unfortunately fallen victim to the impact of the global credit crisis. We are sad to report that our overall supplier has ceased trading, and we are as yet unsure whether we will see either our overalls or the money paid for them returned to us. Workwearhouse ceased trading on 17th September, whilst our order was still awaiting dispatch. Unfortunately, this means we are currently around £320 down from our limited funds. James Lee, Team Co-ordinator said "The loss of this money without even seeing the overalls delivered is a huge blow for WVCFR. We are looking to form relations with a local supplier, but the loss of the money means we are relying on donors more than ever now. We hope to work out a solution as soon as the Official Receivers of the Wearhouse Group are appointed". Oxenhope Parish Council has made a grant of £250 towards the cost of kitting Worth Valley Community First Responders out in Protective Clothing. With now nearly 20 responders in the team, PPE (Personal Protective Equipment) remains our biggest cost, and this money will go some way to ensuring all team members are properly protected whilst on duty. Worth Valley CFR's has teamed up with easyfundraising.org.uk to raise more funds which will benefit residents and visitors to the 'Land of the Bronte's'. easyfundraising is a shopping directory listing some of your favourite online stores including Argos, Next, Amazon, Debenhams, John Lewis, Toys R Us, HMV and over 600 others. Just use the links on the easyfundraising site whenever you shop online and, at no extra cost to you, we'll receive a free donation of up to 15% from every purchase you make. It really is that simple! It’s completely FREE to register and you won’t pay a penny more for your shopping when you use the easyfundraising site. In fact you can even SAVE MONEY as many retailers offer discounts, special offers and even 'e-vouchers' exclusive to easyfundraising. If you shop online anyway then why not raise valuable extra funds for us by using this fantastic scheme. All you need to do is visit http://www.easyfundraising.org.uk/wvcfrs and when you register, select Worth Valley Community First Responder Service as the organisation you wish to support. Worth Valley CFR's is to benefit from a generous donation of £300 from the Charities Committee of Subsea 7 Ltd, which is one of the world’s leading subsea engineering contractors. The company has offshore operations supported out of the UK, Norway, Middle East, West Africa, Singapore, Australia, Brazil, United States and the Caspian and employs 3000 world-wide. This donation will assist us to purchase a selection of Protective Clothing to ensure that our responders are visible at night, and also to protect their own clothing. James Lee, Team Coordinator for WVCFR said "This generous donation from Susea 7 will be put to good use ensuring that we have a visible image accross our area, and will also help us to fulfil other plans including the 'Can We Find You...' campaign due to roll out soon across the Worth Valley. I extend the whole teams thanks and best wishes to everyone at Subsea 7". Worth Valley CFR's First Summer Dance, held on the 12th July at Parkside Social Club, was a roaring sucess. Initial indications are that after expenses were paid, this well-attended event raised over £100 for our equipment fund. It also gave us an opportunity to say 'thanks' to Neil Marsay, Yorkshire Ambulance Community Defibrillation Officer, for the help and care he has given to this fledgling group. Neil has moved on to look after the communities of North Yorkshire, and we wish him well in his next patch. Worth Valley CFR's has hit the headlines in this weeks edition of the Keighley News, and this months Worth Valley Mag (download PDF file). Click the links to see the articles. We are very grateful to the editors of both publications to their support. Worth Valley CFR's would like to pass our congratulations to the latest Responders to undertake and pass the Yorkshire Ambulance Service Initial First Responder Training Course. David & Glenda Joy of Oxenhope, and Michelle Lee of Haworth completed the 2 day training course held over this last weekend. All reported that they had found the course very informative and very well presented, and WVCFR extends our thanks to Neil Marsay and Steve Marshall, both from Yorkshire Ambulance Service. David, Glenda and Michelle will be joining the rota within the next couple of weeks, and I'm sure that they will all be a tremendous asset to the team. In addition we extend our congratulations to Liz and Duncan from Silisden CFR's who also attended and passed the course. Following successful refresher training, we are pleased to announce that Worth Valley Community First Responder Service are live and available for calls with immediate effect. A press release will be issued shortly to local media, and a copy will be published here. We still need more volunteers, especially in the Stanbury, Oakworth and Crossroads areas. Full training is given by Yorkshire Ambulance Service NHS Trust, for more details on becoming a Responder, please click here. Members of the public please note: Do NOT use our telephone number for medical assistance. If you require an ambulance, please dial 999. WVCFR has today recieved notification that we have been accepted as a member of the Keighley Voluntary Services (KVS) organisation. This will enable us to reach a wider audience of potential Responders, as well as being able to utilise the equipment library which KVS holds. We are delighted to join over 50 other local community groups who are already registered with KVS, and look forward to working with KVS in the future. For more information about the work of Keighley Voluntary Services, please click here. Whilst we have now recruited to a team comprising nine committed Responders, Worth Valley Community First Responders Service is on the lookout for more volunteers. We are particularly interested in people living or working in the Stanbury and Oakworth localities. Full training will be given by Yorkshire Ambulance Service (YAS), and our Responders are fully supported by both the Team Coordinator, and YAS. For more information, please see here, or to apply, please click here or telephone the Team Coordinator, James Lee on 07528 067870. Alternatively, email him at worth.responders@yahoo.co.uk. Group Talks, Local Event Stands and Publicity. WVCFR is currently looking to fill our 2008 diary. If you have a club, group, or meeting which is held within the Worth Valley, or has a good proportion of attendees who live in the Worth Valley, we would love to hear from you. We will provide a guest speaker to give a short talk on who we are and what we do, as well as answer any burning questions about our service. Our team also wlecome the chance to attend any Galas, Fun Days or village fetes and will provide a stand where we can give demonstrations and information about the work we do. To book us for a talk or event stand please click here or telephone the Team Coordinator, James Lee on 07528 067870. Alternatively, email him at worth.responders@yahoo.co.uk. We regret that we cannot attend events or group talks outside of the Keighley area.